Well, it's starting to get ugly now. 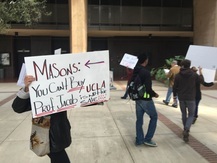 A group calling itself MasonBigotry.org protested today outside of an academic program at UCLA, specifically going after respected professor Margaret Jacob, and demanding that her organization return Masonic sponsorship money because of Georgia and Tennessee's anti-gay policies. They also have a list of "demands" on their website (good luck with that, folks). Also on the website, they have posted video of several confrontations with Masonic groups, and even an interview with Pennsylvania's Past Grand Secretary Tom Jackson. In the grand scheme of things, this is little more than an embarrassment. But especially in California where movements like this are common, I suspect they are going to become more recurrent. Most of the outside world understands little or nothing about the way Masonic administration works, and making changes in Freemasonry is like trying to stop an aircraft carrier. 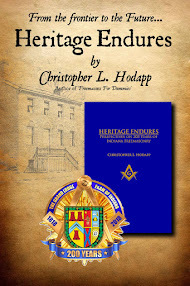 Because of our rules, attempting to change existing Masonic law can take years to accomplish. That doesn't sit well with "movements" like this, who expect their views to be adopted immediately. So, we will have to deal with this for quite some time, I'm afraid. The European comments on the situation speak about "attachments", by which they mean the association of the longstanding racial discrimination with the newer anti gay strictures as a merged problem. As an example, see the French scholar Pierre Mollier's comments at https://www.facebook.com/pierre.mollierlecavailler although the google translation leaves something to be desired. It should be noted that the US executive orders that were amended to extend to the lgbt community to prohibit discriminatory practices. The original orders certainly related more so to defined races. However it should be noted that by definition this would be only discrimination and not racial by any means. Since being of the lgbt category is independent of race categories. Much like age discrimination. Quick edit: Tom Jackson is Past Grand Secretary, not PGM. Thanks, I knew that, just didn't type it. Brothers, I would say many time the refusal to take action is excused away by hidding behind legal speak and precedent quoting. Sometimes action is required were inertia is I Entrenched . Bro. Bower, you make a very good point about the analogy to age discrimination, which of course like race and gender is something people have very limited control over -- which makes holding it against them all the more sad. i suppose an earlier example in Masonic history was the exclusion of brave men who had lost a limb in war because they were not whole. The difference in todays crisis is that the exclusion of African Americans by some grand lodges has been with us for a long time and we have all been guilty of going along, while the gender discrimination comes right after a national debate that was litigated in dozens of courts and settled by the Supreme Court - involving Masonry in what has been a bitter ongoing religious and political controversy -- which only brings grief. The ironic moment when non masons have more fortitude than 'real' Masons to stand up to tyranny. How are thou fallen. When is someone going to act like they have a pair and cease amity? 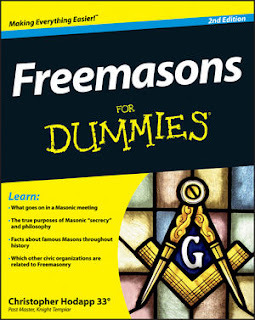 Well, what needs to happen is a sit down to explain to these non masons the process in becoming a mason. No one person sits on a throne and makes decisions. Each lodge has ballots of candidates, its a silent voting process and has to be a 100 percent or the applicant does not pass the ballot. A sitting Master of the Grand Lodge cant just change that by a swipe of the pen. The more rediculous idea is thinking that the Scottish Rite has any control over the Blue lodges, people should educate themselves more before jumping into an ill advised protest. Hell you can learn more on the history channel then understanding what this protest is really about. Its about the fact that the many people and organizations who scream to the mountain tops about wanting to be accepted, ARE OFTEN THE MOST UNACCEPTING PEOPLE.